The 33rd annual Coin of the Year Awards (COTY’s) commenced on the second day of the World Money Fair, with representatives from various mints in attendance to receive awards for 2014-dated coins nominated in eleven categories. 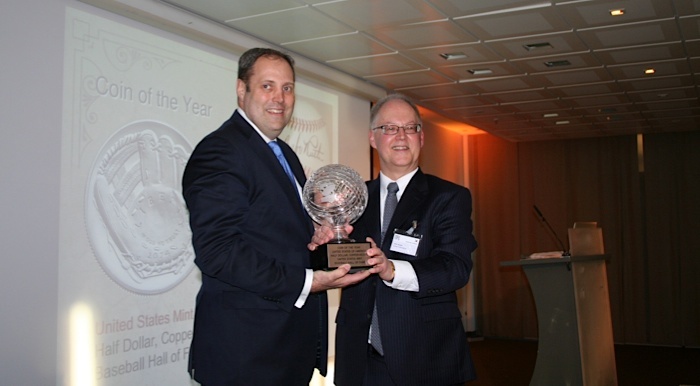 This year saw the return of David Harper, Editor of Numismatic News, as the host and presenter. He began the proceedings with an announcement that the COTY’s may soon look to honor coins in the year following their releases, speeding up the current system which distributes its awards two years after issue. He emphasized that with the assistance of various world mints, this change was entirely feasible and could give the presentation a more current list of nominees to choose from. 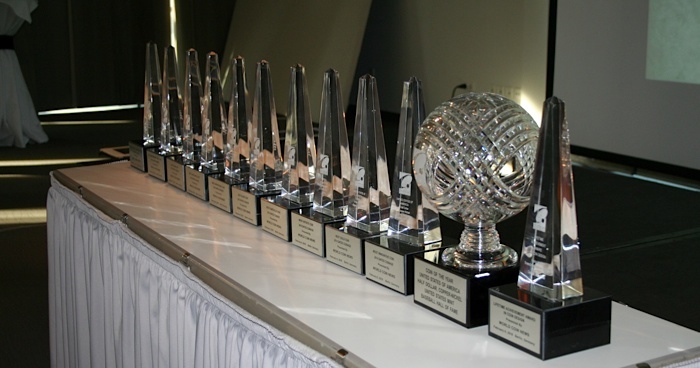 With his opening comments concluded, the awards were underway. 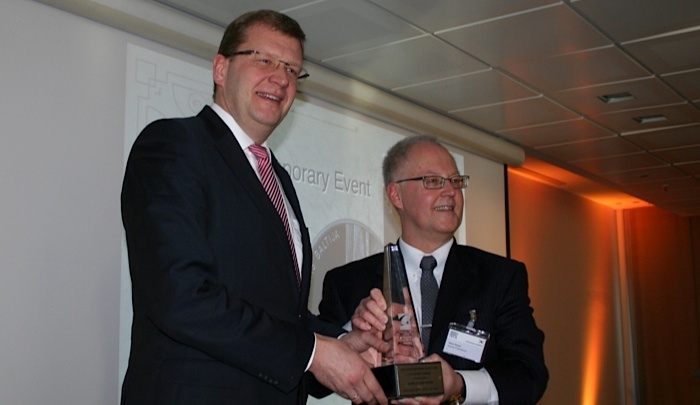 The first award was presented Germany, the host country of the World Money Fair, which won in the Most Historically Significant Coin category. The coin was the 10 mark silver piece celebrating the 300th anniversary of the invention of the mercury thermometer by Daniel Fahrenheit. Although the system is no longer in use in much of Europe, it is still widely used in the United States. 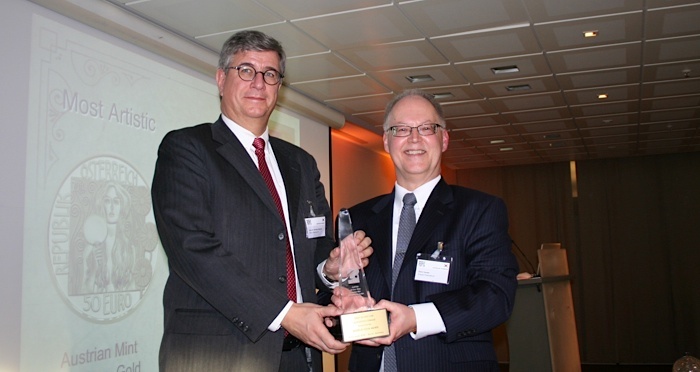 The award was received by the representative of the German Federal Ministry of Finance. The next award went to the Bank of Latvia for Best Contemporary Event Coin. Their coin, issued in 2014, marked the 25th anniversary of what is remembered as the “Baltic Chain,” which saw citizens from all three Baltic states join hands to link their capital cities, demonstrating their desire for independence from Soviet occupation. Independence was eventually achieved in 1991, and all three states are now members of the European Union. Canada is often recognized at the COTY’s for their interesting and technically innovative coins, and this year as no exception. The Royal Canadian Mint (RCM) won the category of Best Crown Coin for their $25 silver Maple Leaf canopy color enhanced application. The design was inspired by what is visible by looking upward while standing in the middle of a forest of maple trees. 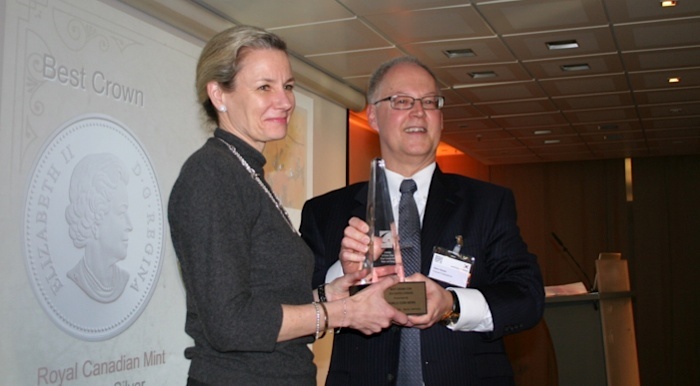 The award was presented to RCM CEO Sandra Hanington. The United Kingdom was honored in the category of Best Circulating Coin for a bi-metallic £2 piece marking the centennial anniversary of the commencement of the First World War. The reverse design included a re-creation of the well-known recruitment poster featuring an image of Lord Kitchener. 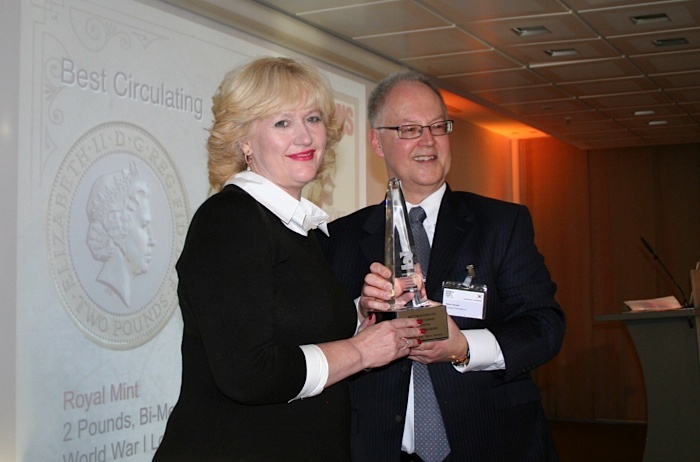 Anne Jessop, the recently appointed head of the Commemorative Coin Department, accepted the award on behalf of the Royal Mint. The category of the Most inspirational Coin was easily won by Poland with their silver coin remembering the centennial anniversary of the of birth of Jan Karski, who developed a means of communicating the harsh realities of Nazi labour camps and Warsaw ghettos by inserting vital information into a hollowed-out key. His contributions were considered to be of the greatest importance when the Allies brought charges of crimes against humanity to those in charge of concentration camps. 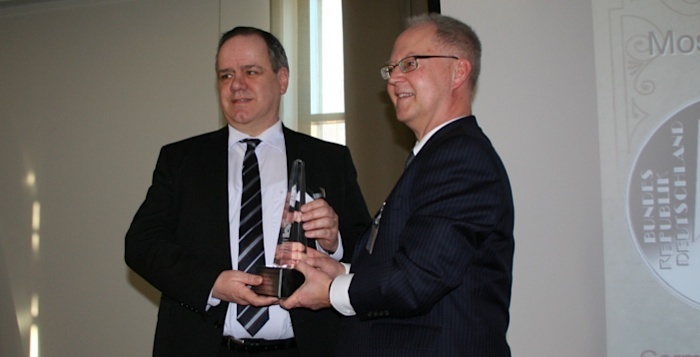 Representatives from the Mint of Poland and the National Bank of Poland Bank were on hand to accept the award. It is not unusual for the coins of Austria to be nominated in more than one category at the COTY’s; this year was one of their best, as they were successful in the categories of Best Silver Coin, Best Bi-metallic Coin and Most Artistic Coin. Of particular interest was the 2014 20 euro silver coin, which remembered the 25th anniversary of the fall of the Berlin Wall. The coin’s design cleverly depicted a young man walking through the dismantled section of the wall, utilizing images of him from the front and from behind. The Gustav Klimt gold coin was judged to be the most artistic. An image of one of the women who played an important part in the life of Klimt was depicted on this issue, which is part of a five year series. Austria’s niobium coin highlighting evolution was also a favorite, due to the various shades of color it employed via an oxidizing process; it was chosen as best bi-metallic. Mr. Gerhard Starsich, General Director of the Austrian Mint, received all three awards and thanked the voters who made their wins possible. The United States had one of their best ever COTY’s, thanks to the 2014 Baseball Hall of Fame coins, favored for their concave shape and overall design. The $5 gold and half dollar cupro nickel issues of these coins earned well-deserved awards in the categories of Best Gold Coin and Most Innovative Coin. With all votes tabulated, the ten winning designs were considered for the overall Coin of the Year Award, a distinction that went to the half dollar Baseball Hall of Fame coin. The last recognition of the afternoon was the Coin of the Year’s lifetime achievement award for outstanding coin design. 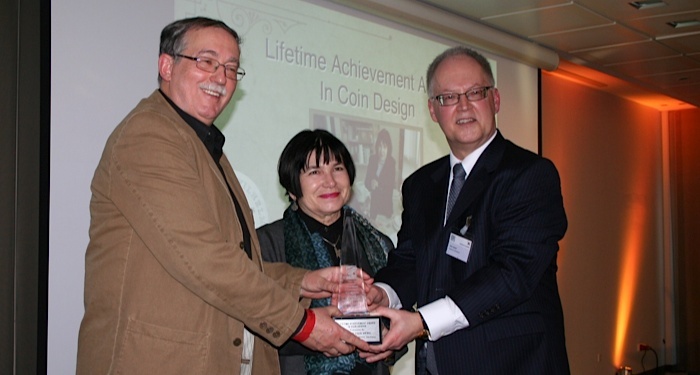 This year, a husband and wife team were honored for their significant work in German coin design. The work of Heinz Hoyer and Sneschana Russewa-Hoyer’s is well known to many German coin collectors. Their work was originally seen on the coins of the German Democratic Republic. Thereafter, they made the transition from the former East German Mint to design coins for the Federal Republic. One of their lasting and more familiar works is that of the present obverse designs currently seen on German circulation one- and two-euro coins. We will keep readers updated on COTY nominations in the run up to next year’s ceremony, which will be held on the February 4, 2017. Images of many of the coins recognized above can be found here. umm where are the pics of each coin?